You are here: Home / What is Hanukkah? No matter how you spell it, Hanukkah is the Festival of Lights, the holiday that commemorates the rededication of the Jewish temple in Jerusalem in the 2nd century BCE. Though Hanukkah has become especially popular because it falls close to Christmas-time every year, it is actually considered to be a minor holiday on the Jewish calendar. It is also one of the later Jewish holidays to have been instituted, and does not appear in the Torah because the events occurred after the Torah was written. In 175 BCE, Antiochus IV Epiphanes gained control of Judea. He outlawed the Jewish religion, and in 167 BCE went so far as to desecrate the Holy Temple by having an altar to Zeus placed there and ordering pigs to be sacrificed (very not kosher!). A rebellion was led by the Jewish priest Mattityahu and his five sons, one of whom, Judah Maccabee, took over the rebellion after his father died. The family was called the Maccabees or the Hasmoneans. In 165 BCE, the Jews managed to defeat their oppressors and to rededicate their sacred temple. According to the Talmud, after the temple was cleaned, olive oil was needed to fuel the light of the menorah (candelabrum). Though there was only enough oil to burn for one day, the oil lasted eight days. On Hanukkah, Jews celebrate their religious freedom and what is considered to be a great miracle that occurred. 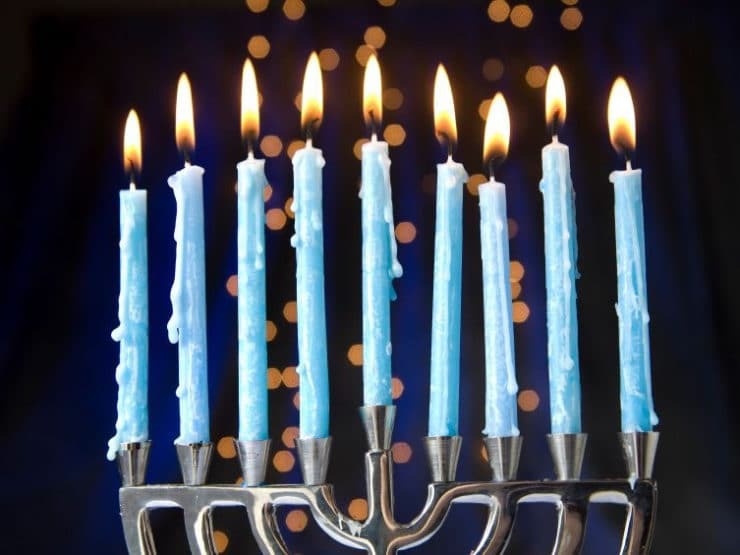 Hanukkah is celebrated for eight days, in honor of the miracle of the oil that lasted eight days in the Holy Temple. Unlike some other Jewish holidays where work is forbidden, there are no restrictions on doing work during Hanukkah. On each day, Jews light candles on a hanukkiah (a nine-branched candelabrum), starting with one candle and adding one more each day. The candle used to light the other candles is known as the shamash. Blessings over the candles are chanted and festive songs are sung, commemorating the Maccabean Revolt. Children (and adults!) play a game called dreidel (a dreidel is a spinning top that shows four Hebrew letters: nun, gimel, hey, shin, which stand for the phrase “A great miracle happened there.” In Israel, one letter is changed: nun, gimel, hey, pey, to stand for the phrase, “A great miracle happened here.”) It is customary to give Hanukkah gelt(chocolate coins) as small gifts. Though many Jews nowadays give more elaborate gifts during Hanukkah, this practice developed because of the holiday’s proximity to Christmas and is not a traditionally Jewish custom. What kinds of foods are eaten on Hanukkah? On Hanukkah, Jews eat food that is deep fried in oil, another (tasty) reminder of the miracle of the oil. A classic Hanukkah dish is crispy potato pancakes called latkes in Yiddish and levivot in Hebrew, often served with applesauce and sour cream. Another delicious Hanukkah treat is sufganiyot (jelly-filled donuts), usually topped with powdered sugar. Sephardic Hanukkah donuts are called bunuelos (or bimuelos) and are traditionally dipped in honey. What is the proper greeting for Hanukkah? To wish someone a Happy Hanukkah, say “Hanukkah Sameach!” (Happy Hanukkah) or simply “Chag Sameach!” (Happy Holiday). Or if you want to show off your Hebrew skills, say “Chag Urim Sameach!” (urim means “lights”). On the Hebrew calendar, Hanukkah is celebrated on the 25 of Kislev, and continues for eight days. The name “Hanukkah” is derived from the Hebrew phrase “they rested on the 25th” (i.e., the rebellion ended that day).